There's an awesome group for Jack Russells in Singapore called Jack Russell Mania. In fact, Mummy and myself are Facebook members of the group for quite a while now. Anyway, JRM had a booth at Serangoon CC over the weekend. So, Mummy swung by to show her support as well as to purchase a couple of shirts just for Pecan ah ma and myself. Well, the tricky part was... it comes in just two sizes - S and M.
Mummy went ahead to purchase one of each size. I mean, sounds right since I'm about a size bigger than ah ma. I look like a freaking SAUSAGE! On the other hand, ah ma looks like a youngster wearing a cropped top. Of course Mummy had to burst into her evil laughter for a good five minutes, before putting us on the chair to get us to pose. I seriously could not breathe man. I put on my best begging face to convince Mummy to take it off. Yap, it was futile, obviously. To make things worse, ah ma seems to be liking it. 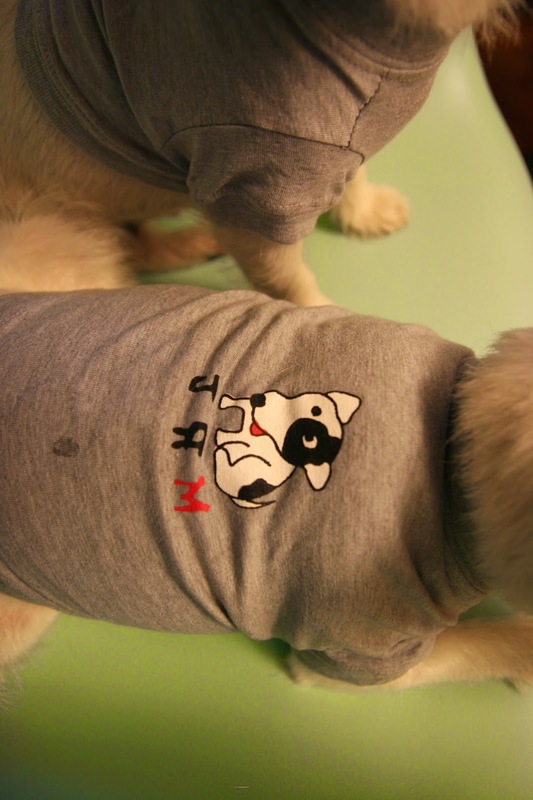 the shirt is so tight that the JRT on the back of it actually looks more like a cow now. To make my life even more tragic, ah ma actually drooled on me!!!! Sure hope that JRM comes up with a larger size. Cos there is NO WAY I'm gonna walk out the door in that shirt. And to think that Mummy attempted to console me by telling me that tight-fit is the in thing now. YOU THINK I STUPID OR WHAT? Despite having to don such an ill-fitting outfit, I'm still a proud member of JRM! And I can't wait to attend their annual gathering on the 27th July!